All I need now is £35,000, or $57,000 or €40,000 whichever way you want to look at it! That's everything all in - I just have to get myself to the meetings, turn up and ride - we get to keep the bike at the end of the season - so I suppose that's something. What do you think? Do you think I could manage to find 35 people who would pay £1,000 to join a club with a 1 in 35 chance of owning the bike? Lot's of time and effort has gone into the revamping of my main website. Click below to check it out - you might need to reload it in your browser. I've also updated my dedicated coaching website with a photo gallery so you can see what we get up to on a 1-2-1 training day. 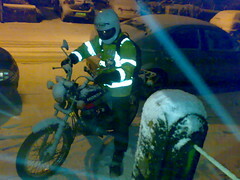 Been called out to do some ploughing and gritting. Plenty of snow. Only way I can guarantee not to get stuck on the way to work is to go on the CG. 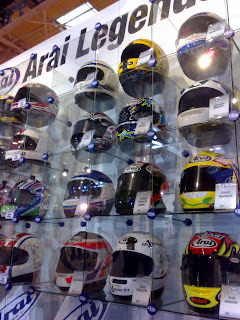 My helmet on the Arai Legends display - amongst some top riders. Can you name any of the other rider's helmets?